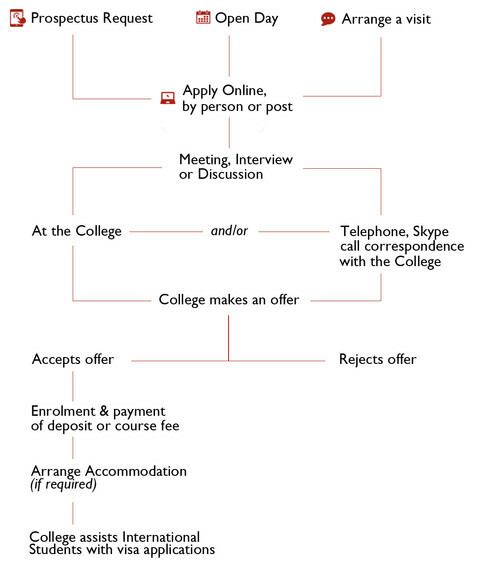 Please telephone for an appointment to visit the College or complete our arrange a visit form. After enquiring about one of our courses, you will meet senior members of staff (usually one or both of the Vice Principals) and will be shown around the College. The Vice Principals are both teachers with a combined experience of over 60 years of successful classroom teaching in independent education, preparing students for entry to the most prestigious universities. To enable our staff to give you the best possible advice, it is necessary to bring with you copies of previous examination results and school reports. If you wish to sit in on classes for a couple of days, this can be arranged, at certain suitable times. Once you have visited the College, we will let you know if we are able to offer you a place. If you decide to accept, you then need to complete an application form and pay a deposit (please see our Terms and Conditions) to secure the enrolment. For international students it may not always be possible for you to visit the College. You can obtain all the information you require either by contacting the Admissions Registrar (+44 020 7221 6665 ext 103) or by e-mailing info@davidgamecollege.com. We are happy to hold telephone conferences with prospective students and to give information and answer all questions by email, telephone or Skype. David Game College is very flexible in its admissions policy. Students who wish to transfer to the College after taking their AS levels or who wish to re-take AS levels can usually be accommodated. If transferring to David Game College involves a change of examination awarding body ("board") in one or more of your subjects, this is now usually straightforward given the linear nature of the new AS and A levels. In A level Biology, Chemistry and Physics, an endorsement declaring “competence in practical work” is transferable from one awarding body to another, so a student in this situation coming to David Game College to retake would not have to undertake any further practical work. This requires routine administration which our Examinations Officer will take care of. In A level subjects involving teacher-assessed coursework - for example English Literature and History - the process of transferring marks from one awarding body to another (if necessary) is a little more complicated and some applications are refused on the grounds that the coursework carried out at the previous school is incompatible with the specifications we follow here. In such cases, the student would have to submit a new piece of coursework here. Students who have completed AS levels (Year 12) elsewhere do not necessarily have to repeat them on transferring to David Game College. Depending on the individual circumstances (for example, the AS grades obtained and the GCSE grades from the previous year), a one year intensive A level course might well prove to be the most appropriate option in terms of the proposed course here. Detailed advice will be given during the interview for a place here. Whatever your circumstances, we will guide you through all the administrative red tape and explain everything to you in simple terms. You can contact our examinations office by telephoning 020 7221 6665, or sending an e-mail to exams@davidgamecollege.com. The online application form takes about ten minutes to complete. It is important that all sections on the form are completed and the information you provide will enable us to confirm your suitability and if appropriate, offer you a place on a course.